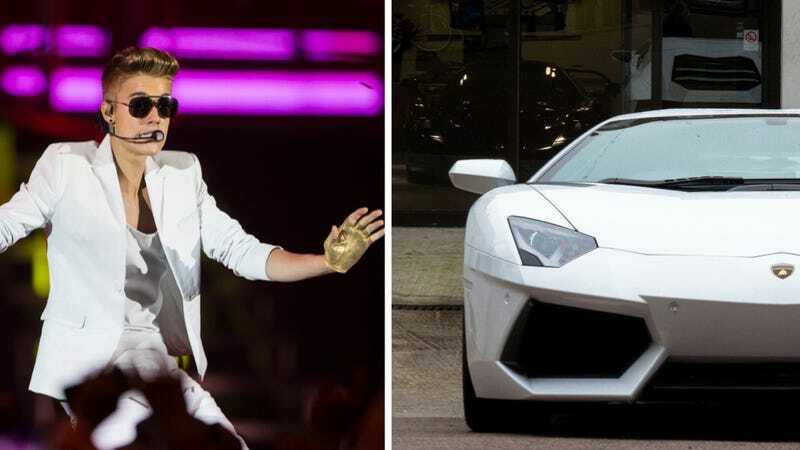 What's Going On With Justin Bieber And Lamborghinis In Dubai? Is Canadian pop singer and chrome Fisker enthusiast Justin Bieber facing arrest in Dubai after flouting speed limits in a borrowed Lamborghini? Maybe, maybe not. But that's what's being claimed on a growing Reddit thread at the moment. The thread on r/music says that Bieber showed up two hours late for a concert in Dubai (one of which he was apparently attacked at), even after running red lights and hitting 150 mph in a Lamborghini to get there. The OP says that Dubai police have had enough and are attempting to arrest him. The cops have also apparently confiscated his cars and seized his passport. Bieber is apparently hiding backstage because authorities want to bring him in. Um, yeah. Bieber arrested for disobeying traffic laws in a Lambo. In Dubai. That's what they say on Reddit, anyway. And on Twitter. There are a lot of girls on Twitter whose accounts are devoted solely to Bieber news and worship. Anyway, no news reports have surfaced to back any of this up at the moment, but it must be noted that E! 's Twitter account falsely reported that Bieber had been arrested in Dubai yesterday following a hack. Is this all just the mad musings of some bored anti-Belieber? Quite possibly. I'm extremely skeptical of the accounts at this point, but we'll see what develops. Either way it's hilarious. All we know is that if Bieber tries to run, the Dubai cops have what it takes to chase him down. Update: The Atlantic Wire has some information into the attack on stage, and they mention the Reddit thread, but still no confirmation. Update: The OP on Reddit reports that police have allowed Bieber to leave the venue and are not arresting him at the moment. Again, no outside confirmations of any of this strange, sordid tale. Hat tip to creative accidents!